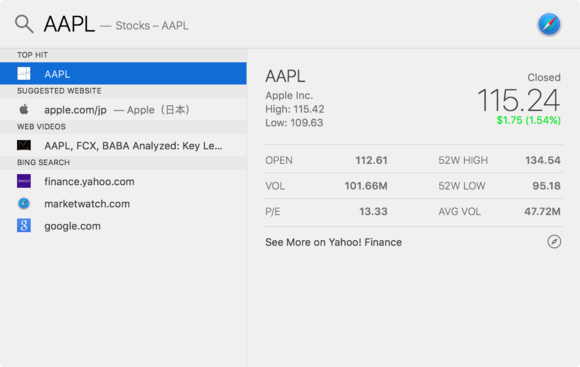 A look at the tweaks to the built-in search engine in OS X 10.11. Recently, I took a close look at Spotlight in Yosemite. 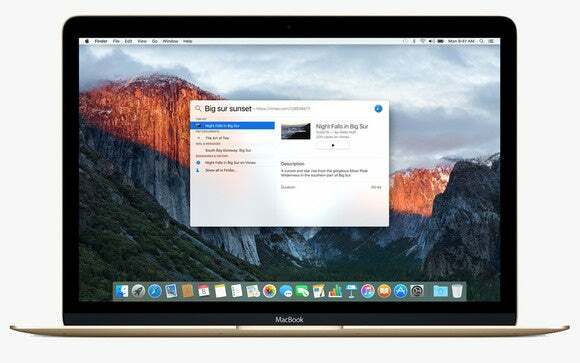 With the release of El Capitan, it's time to look again at Spotlight, which gets some new features with the OS upgrade. Spotlight already used your location to give you results from Maps. Search, for example, for a restaurant, and find one nearby, and see directions, photos, TripAdvisor reviews, and contact information. 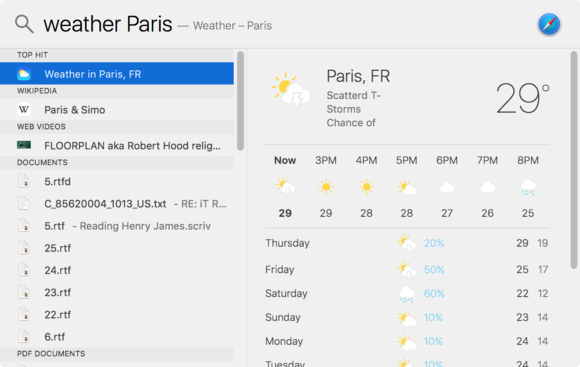 You can get now a weather forecast with a few keystrokes. I found that if I simply typed "weather" Spotlight shows the local forecast. Find the weather where you are, or where you’re planning to travel. You can find your nearest movie theater or Apple Store, look for local supermarkets, find a gas station, a coffee shop, or search for other things near you, as you can in Apple’s Maps app. Spotlight can also search for stock prices, and give you links to websites that have more information about the shares you look up. Search for a stock price, and click through to a number of websites that offer financial information. Spotlight is lets you search for files using natural language, such as “Documents I worked on last week.” It finds files of all types, including those on iCloud Drive, attachments to emails that I opened last week, and more. You can ask to see emails from a specific contact; this works best if you enter both the sender’s first and last name, but if the person has a unique first name, the first name is sufficient. Apple says you can search for web videos, but this category only shows up for me if I include, in my search, the words YouTube or Vimeo; and I only ever get a single video in my search results. It’s too bad you can’t view a preview of a video in the Spotlight window; the thumbnail you see below with the play button just opens a webpage. 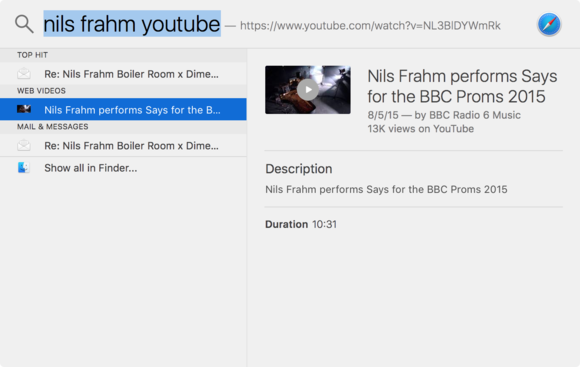 You can find web videos with Spotlight, but not many. One of the biggest changes to Spotlight in El Capitan is the ability to resize the window. (That deserves a big “finally.”) Drag from the bottom to see more in Spotlight, but you can’t make this window smaller than the default size you see when you first launch Spotlight, nor can you make the window wider. Once you’ve resized the window, it stays at that size as long as you don’t change it back. You can also move the search box around on the screen. If you’d rather it display on one side of your screen, or higher or lower than where it displays, just click on it and move it. Editor's note: This article was originally written using the El Capitan beta. It has been checked and updated using the El Capitan released version.